Vicky’s Fleurie was selected amongst the 3 wines of the week by David Williams in The Guardian, it was late November 2015 and I am telling you all about it today. The year 2016 starts fast, the fog reminds us, at least when we drive, that we should not forget to set the “slow life” mode. It’s very soon the time to print vicky’s rosé labels, there are not much left. It’s time to evaluate 2016 sales for a next order. “Flowing, pretty, red-fruited contents being utterly delightful and true to the character of Beaujolais’ Fleurie region.”. 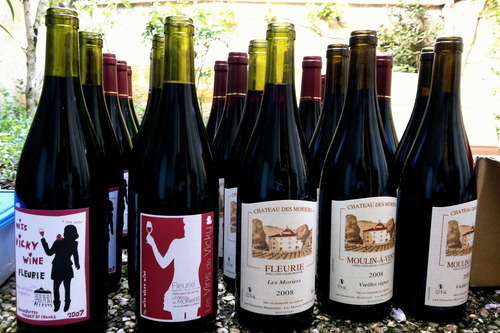 David Williams, The Guardian, Novembre 2015 (à propos du Fleurie 2013 du Chateau des Moriers). Luckily for David Williams, this wine also exist in a more classic version, with a label created by my father who used an old representation of the house. I really hope this will please David so that in the future, he can still drink this delicious wine. Coming back to Vicky’s wine story, it’s just mine, the one of my blog, my family, the people I have met and all my travels. It is the story that made me what I am today and got me known as Vicky. Through Miss Vicky Wine persona, I have made friends and met the man of my life. You can’t please everyone and overall, with David, we agree on one point : whatever the bottle, as long as what’s inside is good! Pleasure from any source is always welcome. Let’s toast! Cheers and see you around the corner mister William!